Fort Lauderdale, FL, April 17, 2019 --(PR.com)-- An illustrious rising star with an ever-growing fan base, Nadya is all set to showcase a darker, edgier side to her talents with the upcoming single “Beyond Darkness.” This will mark her first collaboration with the diverse song-writing duo Unfettered consisting of Jack Slater and Wan Ying Chan. "Beyond Darkness" is dark and brooding yet melodic piece which builds steadily before arriving at a dramatic and triumphant climax. It takes the listener on a journey, encouraging them to seek out the glimmer of hope in the darkest places. Nadya highly values creativity and originality and is always seeking meaningful collaborations that can help to bring a whole new tone to her art. Join her now on a journey beyond darkness with this resonating new single. Nâdya recently became one of the very few crossover artists from the Asia to have ranked and charting in the top 50 of the Global Adult Contemporary Charts simultaneously. Nadya was recently recognized by the World Songwriting Awards in December of 2018 for her song with Oleksa Kaminsky: "Lepaskan" where she received the Best Song Award – in the World Music category. Nadya was also recognized and commended for her song "Path of Love" in the UK Songwriting Awards as well as a Finalist at World Songwriting Awards in the Pop Music category. Talented, radiant and atypical, Nadya is a citizen of here and elsewhere, who seizes her pen as soon as she feels the urge to inspire and share her stories through music. 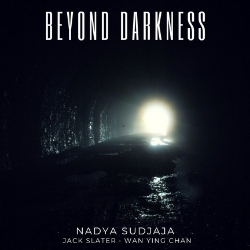 Listen to Nadya's upcoming release, "Beyond Darkness"